Your favorite product: A steel piercing in the abdomen, color zirconium bows S52.12 - is added to the wish list. Piercing in the navel, surgical steel, sanded colored rhinestones, ribbon. Your favorite product: Piercing to the belly of the steel 316L, colorful owlet, the smooth convex surface of PC06.39 - is added to the wish list. A belly Piercing made of surgical steel, glazed multicolor owl is shown the structure of the feathers. Your favorite product: A belly Piercing made of steel 316L, colorful owl with shiny glaze PC07.40 - is added to the wish list. 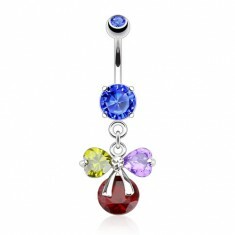 A belly Piercing made of surgical steel, glazed multicolor owl with a smooth and slightly convex surface. Your favorite product: A belly Piercing made of steel 316L - is added to the wish list. Piercing to the belly, steel and marble colored ball. 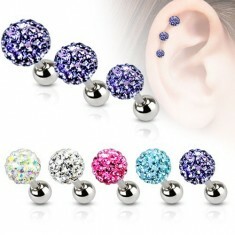 Your favorite product: A steel ear piercing, color zirconium ball, 4 mm S49.08 - is added to the wish list. Piercing in the tragu from steel, color marble inlaid with cut stones. Your favorite product: Ear Piercing made of steel, color zirconium ball, 3 mm S49.25 - is added to the wish list. A steel piercing to the tragu, color ball decorated with cut rhinestones. 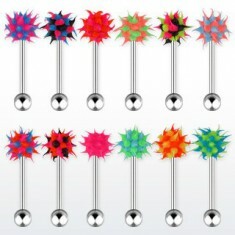 Your favorite product: A steel piercing to the tragu, color ball with florets S50.14 - is added to the wish list. Ear Piercing made of steel, ball of epoxy with a motif of flowers. Your favorite product: A steel ear piercing, color zirconium ball, 5 mm S50.15 - is added to the wish list. Piercing out of surgical steel into the tragu and cartilage, color ball decorated with rhinestones. Your favorite product: A tongue Piercing made of surgical steel, colored ball with florets S53.11 - is added to the wish list. A steel piercing to the tongue, color epoxy ball with a motif of flowers. Your favorite product: Steel body piercing tongue glow in the dark color star M13.21 - is added to the wish list. Piercing out of surgical steel into the language of the completed ball and the star shining in the dark. 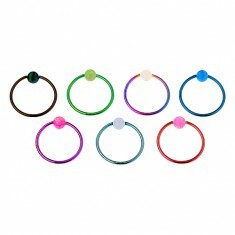 Your favorite product: A steel piercing in the tongue, multicolor silicone head - is added to the wish list. Piercing the tongue out of surgical steel, multicolor furry head out of silicone. Your favorite product: Steel piercing belly, a multicolored owl, big zircon eyes SP44.10 - is added to the wish list. A belly ring made of steel 316L, a symbol of wisdom - owl with his eyes so bright from cut stones. Your favorite product: Piercing made of steel 316L, anodized titanium, the color horseshoe with balls SP68.20 - 22 - is added to the wish list. A steel piercing, the surface of anodized titanium, the shiny horseshoe is closed by the balls, different colors and sizes. Your favorite product: Piercing out of surgical steel, glossy color ring, rainbow marble AC23.11 - 12 - 13 - is added to the wish list. Steel piercing - captiva ring, a small colored ball with iridescent reflections, glossy and smooth surface. 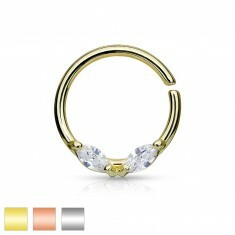 Your favorite product: A steel piercing in the nose, the ring, the two sheer zrnkovité cubic zirconia, different color AB26.28 - is added to the wish list. Piercing nose surgical steel in the form of a simple circle, two clear zircon leaves, different color.